Destiny 2-themed cans of Rockstar Energy Drink. 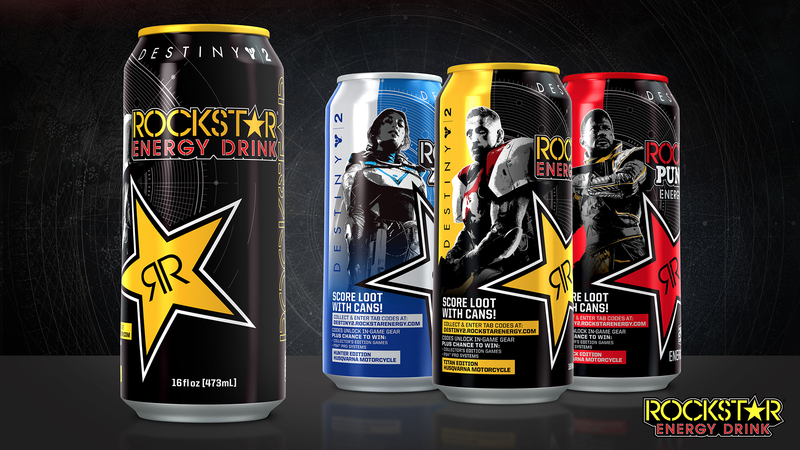 Starting in August, gamers will be able to find Destiny 2-themed cans of Rockstar Energy Drink that have codes for in-game gear and a chance to win daily, weekly, and grand prizes. There are Destiny 2-themed motorcycles among the loot being given away, although they unfortunately bear little resemblance to the Iron Gjallarwing (but hopefully could still come with an Antique Horn already equipped). More information will be available soon at Rockstar’s Destiny 2 site. 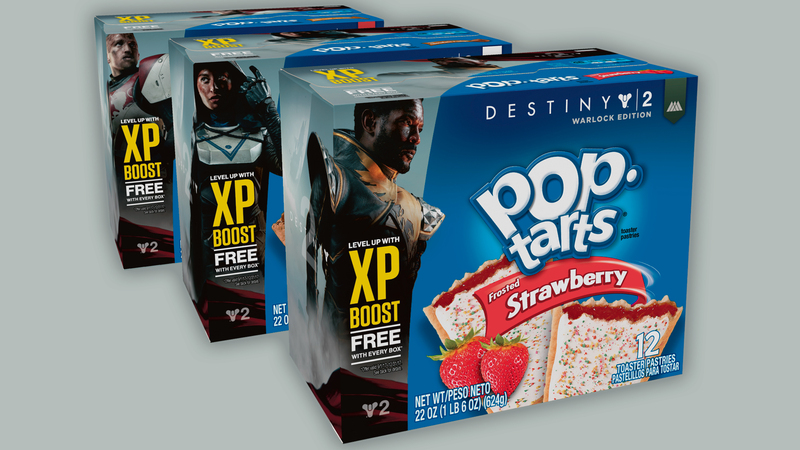 Pop-Tarts packs will feature Guardian subclasses. Collectible boxes of Pop-Tarts will also be coming to retailers starting in September. These will feature custom designs that highlight the Guardian subclasses from Destiny 2, and include an in-game XP boost. Both eight and twelve-count packs will be released under this campaign. More information can be found at Kellogg’s Destiny 2 site. This kind of cross-promotion isn’t new to video games. Back in 2011, codes from specially-marked bags of Doritos and bottles of Mountain Dew granted double XP boosts in Call of Duty: Modern Warfare 3. Battlefield 4 players got the opportunity to unlock battlepacks and enter a sweepstakes by buying Slim Jims and Axe Body Spray when the game launched in 2013. Codes to unlock double XP time and Zombies mode in Call of Duty: Black Ops III were available on Slurpee cups at 7-11 in 2015. And, of course, the first Destiny also had XP boosts and a special in-game quest with exclusive loot through codes from cans of Red Bull when The Taken King expansion was released. Players quickly figured out how to scam that promotion, though, as the algorithm used to generate the codes was not very complex. These partnership choices by publishers over the years is somewhat telling. Slim Jims, Doritos, Slurpees, Mountain Dew, Red Bull, and now Rockstar and Pop-Tarts are all in line with the poor dietary habits stereotypically associated with gamers. At the Xbox Fan Fest just this past June, large tubs of Mountain Dew and Doritos were stationed around the venue during the Microsoft Briefing after-party, likely based on a similar assumption of what the average gamer’s lifestyle is like. It would be interesting to see these kinds of partnerships with products outside of this cliché. Exclusive content certainly does push sales, as we commonly see with pre-order bonuses and special/collector’s/deluxe editions of games. I’ll even admit that the last time I personally bought Slim Jims was specifically for those Battlefield 4 codes (and I was really disappointed to find out that you could only redeem one per platform, as I only had the game on PC and a fistful of jerky). There was a study conducted in 2012 on the impact of branding on healthy food where school children were offered an apple or cookie with their lunch, with one item featuring a sticker of Sesame Street‘s Elmo on alternating days. While there was no change to how often kids picked cookies even when they bore the sticker, they chose apples twice as much when they were ‘Elmo-branded’. Not that a produce partnership would be nearly as profitable, but it might be nice to have a double XP apple over double XP Pop-Tarts. There’s no word yet on what in-game gear will be associated with the Rockstar Energy Drink codes for Destiny 2. The sparrow and ghost shell earned by completing the Red Bull quests in the original Destiny had similar counterparts that weren’t locked behind a code, and eventually became available to all players anyway. Hopefully the same approach will be taken this time around, since it’s bad enough that players will have to continue to put up with timed exclusives going to the PlayStation before the Xbox and PC. Destiny 2 launches on the PS4 and Xbox One on September 6th, and on PC on October 24th.